Anywhere Festival is about to kick off in Brisbane! To celebrate the making of art all over Brisbane — outside, inside, on the airwaves, in the elevator, in the streets, in your pants — OffStreet Arts will feature super-rad Q&As with some of the festival’s most exciting acts. To begin with, I chatted with Scott Sneddon, aka Darkwing Dubs, about his show, MaXimal! Q. Describe your show/s in under 25 words or fewer. A. A very stupid idea: pooling together spoken word, hip-hop, songwriting and comedy into an hour of crazy. It’s awesome. Q. Anywhere Festival is about making art … anywhere. What makes your venue unique? A. I got a river view, at The Edge — right on Southbank next to the library. With boats n stuff going past. Plus The Edge is awesome and I’d do anything to support them! Q. If your show were a new My Little Pony, what would it look like? What would its superpower be? A. It would have a ninja outfit and jump out — like HOOYA — and you would say that it wasn’t a good ninja because you saw it coming but then you would start choking and the My Little Pony Ninja would be like, “Or am I the best ninja ever?” But you’d never get to answer the question cos you’d be dead. Q. What is maximalist poetry? A. Maximalism is everything you’re not meant to do in poetry — it’s not earnest, serious or clever. It’s basically a pisstake of the whole thing and heaps of fun and something that tends to make people cry with laughter. Therefore it is my favourite thing ever invented by me. MaXimal! 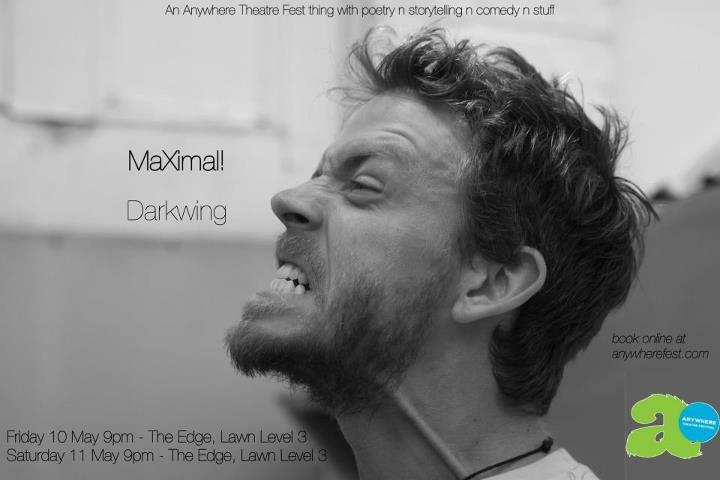 runs on the lawn, level 3, The Edge (SLQ) from 10 to 11 May, 2013, as part of Anywhere Festival.